Alastair Reynolds is probably best known for multi-book space operas including the Revelation Space series and more recently, Poseidon’s Children. 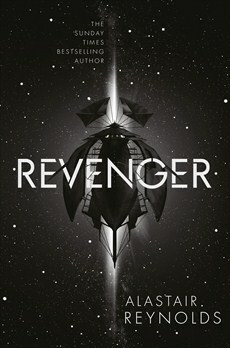 While these books can sometimes be a little ponderous, Revenger is anything but – it has a plucky heroine, space battles, cliffhangers, double crosses, buried treasure and an implacable, violent and possibly mythic foe. Revenger is pre-steampunk far-future retro pirate-homage – from the space craft that fly under sail to the antiquarian speech (people are “coves”, eyes are “lamps”) to the clothes. And while the concept of space pirates is not a new one, the setting is the type of deep, fascinating and ancient-feeling piece of universe building that sets Reynolds’ novels apart. In this universe, the human (aka “monkey”) civilization is spread across a myriad of artificial habitats, in a single solar system that has survived numerous rises and falls. This includes previous and continuing interactions with aliens given common names like Ghosties, Crawlers and Clackers. Sisters Adrana and Arafura Ness, seeking to rebuild the family fortune, sign on with Captain Rackamore (shades of Calico Jack Rackham, a real pirate famous, among other things, for inventing the Jolly Roger) who with his crew, hunts for ancient treasures. But when Rackamore and his crew run into the dread pirate Bosa Sennen everything changes. While deeper secrets touched on in Revenger are left hanging and likely to be the seeds of further volumes, this is a fairly straight forward tale full of characters often drawn from pirate lore central casting. At first blush, the presence of a teenage heroine implies that this might be a YA novel – although the personal journey of narrator Fura Ness, is as much a hardening as a coming-of-age. But Revenger is really a book for any fan who likes their universes complex and their science fiction cutting edge but who also likes their swashes buckled and their timbers shivered. This review first appeared in Aurealis #95, Australian Science Fiction and Fantasy Magazine, www.aurealis.com.au.